Grace Windows is a family run business and has been installing double glazing and conservatories in Surrey, Berkshire and West London as well as all the surrounding areas for over 25 years now. We have the skills and expertise required, to carry out any kind of double glazing requirements that you have. 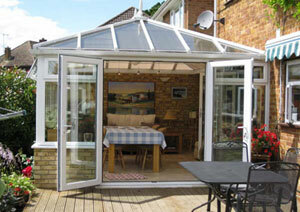 We specialise in Conservatories and have fantastic portfolio of previous jobs. Whether you are looking for a new conservatory, replacement double glazing, uPVC windows and doors, a garage conversion or just some minor home improvements, Grace Windows is a window company you can trust to offer you a quality service at a price to suit your budget and you can rest assured that you are in good hands. Throughout our 25 years experience as a double glazing window company, we have been perfecting our craft and taking pride in every single job that we do. You can call our team anytime to have a relaxed and friendly conversation and arrange a consultation, where we can answer all of your questions and provide you with all the options available. Call us now on 020 8582 1657 for a free quote. Grace Windows are professional team of experts specialising in double Glazing, conservatories and double glazed UPVC Windows and Doors in Surrey, London and Berkshire. Contact us today on 0208 582 1657 to find out how we can help you!